Nationally recognized law firm, Lowenstein Sandler, has a passion for understanding clients' needs and providing key counsel in every case they represent. But when it came to managing numerous office locations, The outdated and laborious process of manually tracking employee time and labor management by paper management became too tedious to handle. 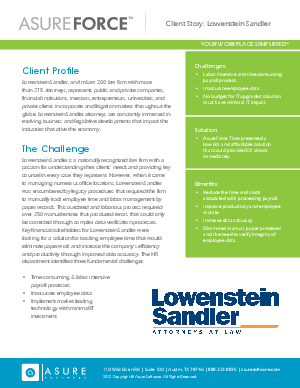 Key financial stakeholders for Lowenstein Sandler were looking for a solution for tracking employee time that would eliminate paperwork and increase the company's efficiency and productivity through improved data accuracy. As a result, they settled on AsureForce Time & Labor Management Solutions and experienced cost benefits associated with web-based solutions, improved productivity and increased accuracy.